Konstantin Pavlovich (Russian: Константи́н Па́влович; 27 April 1779 – 27 June 1831) was a grand duke of Russia and the second son of Emperor Paul I and Sophie Dorothea of Württemberg. 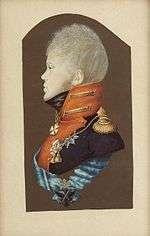 He was the Tsesarevich of Russia throughout the reign of his elder brother Alexander I, but had secretly renounced his claim to the throne in 1823. For 25 days after the death of Alexander I, from 19 November (O.S. )/1 December 1825 to 14 December (O.S. )/26 December 1825 he was known as His Imperial Majesty Konstantin I Emperor and Autocrat of All the Russias, although he never reigned and never acceded to the throne. The succession controversy became the immediate cause of the Decembrist revolt. Konstantin was known to eschew court etiquette and to take frequent stands against the wishes of his brother Alexander I, for which he is remembered fondly in Russia, but in his capacity as the commander-in-chief and de facto viceroy of Congress Poland he is remembered as a ruthless ruler. Konstantin was born in Tsarskoye Selo on 27 April 1779, the second son of the Tsesarevich Paul Petrovich and his wife Maria Fyodorovna, daughter of Friedrich II Eugen, Duke of Württemberg. Of all Paul's children, Konstantin most closely resembled his father both physically and mentally. Prince Potemkin's mind is constantly taken up with the idea of creating an empire in the East; he has managed to fascinate the Empress with these feelings, and she proved so subject to his chimeras that she christened the new-born Grand Prince Constantine, gave him as nursemaid a Greek by the name of Helen, and talks in her own circles about how place him on the throne of the Eastern empire. At the same time she is setting up a town at Tsarskoe Selo to be called Konstantingorod. 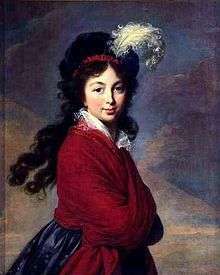 Princess Juliane of Saxe-Coburg-Saalfeld aka Anna Fedorovna. The direction of the boy's upbringing was entirely in the hands of his grandmother, the empress Catherine II. As in the case of her eldest grandson (afterwards the emperor Alexander I), she regulated every detail of his physical and mental education; but in accordance with her usual custom, she left the carrying out of her views to the men who were in her confidence. Count Nikolai Saltykov was supposed to be the actual tutor, but he too in his turn transferred the burden to another, interfering personally only on exceptional occasions, and exercised no influence upon the character of the passionate, restless and headstrong boy. The only person who exerted a responsible influence was Cesar La Harpe, who was tutor-in-chief from 1783 to May 1795 and educated both the empress's grandsons. Catherine arranged Konstantin's marriage as she had Alexander's; Juliane of Saxe-Coburg-Saalfeld, 14, and Konstantin, 16, were married on 26 February 1796. Juliane was unhappy in the marriage, and separated from Konstantin in 1799; she went back permanently to her German home in 1801. An attempt by Konstantin in 1814 to win her back broke down in the face of her firm opposition. During this time, Konstantin's first campaign took place under the leadership of Suvorov. The battle of Bassignana was lost by Konstantin's fault; but at Novi he distinguished himself by personal bravery, so that the emperor Paul bestowed on him the title of tsesarevich, which according to the fundamental law of the constitution belonged only to the heir to the throne. Though it cannot be proved that this action of the tsar denoted any far-reaching plan, it yet shows that Paul already distrusted the grand-duke Alexander. Konstantin never tried to secure the throne. After his father's death in 1801, he led a disorderly bachelor life. He abstained from politics, but remained faithful to his military inclinations, without manifesting anything more than a preference for the externalities of the service. In command of the Imperial Guards during the campaign of 1805, he had a share of the responsibility for the Russian defeat at the battle of Austerlitz; while in 1807 neither his skill nor his fortune in war showed any improvement. After the peace of Tilsit he became an ardent admirer of Napoleon and an upholder of the Russo-French alliance. He therefore lost the confidence of his brother Alexander; to the latter, the French alliance was merely a means to an end. This view was not held by Konstantin; even in 1812, after the fall of Moscow, he pressed for a speedy conclusion of peace with Napoleon, and, like field marshal Kutuzov, he too opposed the policy which carried the war across the Russian frontier to victorious conclusion upon French soil. His personal behaviour towards both his own men and French prisoners was eccentric and cruel. During the campaign, Barclay de Tolly was twice obliged to send him away from the army due to his disorderly conduct. His share in the battles in Germany and France was insignificant. At Dresden, on 26 August, his military knowledge failed him at the decisive moment, but at La Fère-Champenoise he distinguished himself by personal bravery. In Paris the grand duke excited public ridicule by the manifestation of his petty military fads. His first visit was to the stables, and it was said that he had been marching and drilling even in his private rooms. Konstantin's importance in political history dates from when his brother, Tsar Alexander, installed him in the Congress Poland as de facto viceroy (however he was not the "official viceroy" - namestnik of the Kingdom of Poland), with a task of the militarization and discipline of Poland. In the Congress Poland created by Alexander he received the post of commander-in-chief of the forces of the kingdom; to which was added later (1819) the command of the Lithuanian troops and of those of the Russian provinces that had formerly belonged to the Polish-Lithuanian Commonwealth (so called Western Krai). Alexander's policies were liberal by the standards of Restoration Europe; classical liberals lapped up the freedoms of education, scholarship, and economic development, but key deficiencies in Poland's autonomy of lack of control over the budget, military, and trade left them hungry for more. The Kalisz Opposition, led by the brothers Bonawentura and Wincenty Niemojowski, pressed for reforms including more independence for the judiciary; Alexander, calling their actions an "abuse" of liberty, suspended the Polish parliament (Sejm) for five years, and authorized Konstantin to maintain order in the kingdom by any means necessary. Into this scene of unrest entered Konstantin, attempting to execute his brother's mandate to silence dissent. His efforts to strengthen the secret police (Ochrana) and suppress the Polish patriotic movements led to popular discontent among his subjects. Konstantin also harassed the liberal opposition, replaced Poles with Russians on important posts in local administration and the army, and often insulted and assaulted his subordinates, which led to conflicts within the officer corps. The Sejm, until then mostly dominated by supporters of the personal union with Russia, saw his actions as disobedience of the very constitution of which he felt personally proud. This also led to him being mocked, which he did not help by sending his adjutants with threats to those "guilty" of it, like Wirydianna Fiszerowa. Nevertheless, Konstantin was an ardent supporter of Polish musicians, such as Maria Agata Szymanowska and Frédéric Chopin. After 19 years of separation, the marriage of Konstantin and Juliane was formally annulled on 20 March 1820. Two months later, on 27 May, Konstantin married the Polish Countess Joanna Grudzińska, who was given the title of Her Serenity Princess of Lowicz. 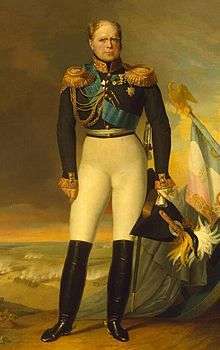 Connected with this, he renounced any claim to the Russian succession, which was formally completed in 1822. After this marriage, he became increasingly attached to his new home of Poland. 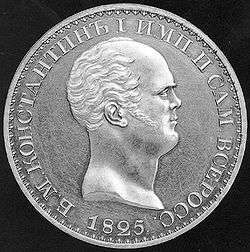 When Alexander I died on 1 December 1825, Grand Duke Nicholas had Konstantin proclaimed emperor in Saint Petersburg. In Warsaw meanwhile, Konstantin abdicated the throne. When this news became public knowledge, the Northern Society scrambled in secret meetings to convince regimental leaders not to swear allegiance to Nicholas. These efforts would culminate in the Decembrist revolt. Under the emperor Nicholas I, Konstantin maintained his position in Poland. Differences soon arose between him and his brother, in consequence of the part taken by the Poles in the Decembrist conspiracy. Konstantin hindered the unveiling of the organized plotting for independence which had been going on in Poland for many years, and held obstinately to the belief that the army and the bureaucracy were loyally devoted to the Russian empire. The eastern policy of the Tsar and the Turkish War of 1828 and 1829 caused a fresh breach between them. It was due to the opposition of Konstantin that the Polish army took no part in this war. An assassination attempt was made on the life of Grand Duke Konstantin, which precipitated the November 1830 insurrection in Warsaw (the November Uprising). After the attempt on Konstantin’s life, a secret court was set up to prosecute those who were responsible. “It was learned that Nicholas had ordered the Grand Duke Konstantin…to start an energetic investigation and court-martial the culprits…the committee at its session of 27 November decided irrevocably to start the revolution on the evening of the 29th, at 6pm.”  Like the assassination, the recruitment of army units by the rebels failed; only two units joined them, and only the capture of the armory and the subsequent arming of the populace kept the revolt alive. Konstantin saw the revolt as a strictly Polish affair and refused to use troops not because he could not but rather because it was a foolish idea politically. He could trust his Russian troops, but to use them might be considered a violation of the kingdom’s independence and even an act of war. Because of this setback he was limited to the resources he had around him; if he did decide to intervene it would require a different source of manpower. He was limited to the handful of Polish troops he could gather together, if he refused to use the Russian troops at his disposal. Konstantin refused to send his troops against the revolutionaries, saying "The Poles have started this disturbance, and it's Poles that must stop it", and left the suppression of the revolt in the hands of the Polish government. 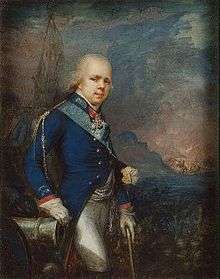 Polish prince Ksawery Lubecki, realizing that the insurgents had formed no government by midnight, assembled some members of the council and other prominent personalities on his own initiative. They decided to send a delegation to the grand duke, but when he stated again that he did not wish to intervene in any way, the committees decided to take matters into their own hands. Konstantin’s involvement remained minimal, he showed considerable restraint in not wanting to use Russian troops to help put down the rebellion. The timid response that he gave them was that he would not attack the city of Warsaw without giving the city a 48-hour notice, that he would intercede between the emperor and the Polish kingdom, and finally not order any of the Lithuanian troops into Poland. What the Grand Duke was trying to accomplish was to remain neutral at all costs, and this led to a belief among his fellow Russians that he was more sensitive towards the Polish independence rather than Russian dominance. The securing of neutrality from Konstantin gave the Polish government the feeling that Russia would not attack them, and gave them the chance to effectively quash the uprising and was then able to effectively defeat the radicals in the country. After securing neutrality from Konstantin, the grand duke retreated behind Russian lines to watch how the scenario would play out. This act further confused the Polish government on the matter of what its status was with Russia. This was due to a promise by the Russians earlier that they were going to help put the rebellion down. The patriotic Poles could not have been more pleased they took the upper hand and the Grand Duke Konstantin on 3 December retreated toward Russia. He himself retreated behind Russian lines but following the failure of the uprising expressed admiration for the valor of the Polish insurgents. The policy of neutrality at all costs has led to Konstantin being viewed two ways through the scope of history, either he would be viewed by the Russian royal family as weak and a sympathizer to the Poles, or he would be seen as a seed for the idea of a soon to be independent Poland, though he was trying to effectively avoid a war. Konstantin died of cholera in Vitebsk (now Belarus) on 27 June 1831; he did not live to see the suppression of the revolution. His frequent stands against the wishes of the imperial family were perceived in Russia as brave, even gallant; but in Poland, he was viewed as a tyrant, hated by the military and civilian population alike, and in Polish literature Konstantin is portrayed as a cruel despot. ↑ Hagen Schulz-Forberg. Unravelling Civilisation: European Travel And Travel Writing. Peter Lang, 2005. ISBN 9789052012353. Page 229. ↑ Jerzy Lukowski, Hubert Zawadzki (2001). A concise history of Poland. Cambridge University Press. pp. 124–132. ISBN 978-0-521-55917-1. ↑ Fiszerowa, Wirydianna (1998). Dzieje moje własne. Warsaw: Świat Książki. ISBN 83-7129-273-2. 1 2 Norman Davies. God's Playground: 1795 to the present. Columbia University Press. ISBN 978-0-231-12819-3. ↑ KONSTANTY PAWŁOWICZ. Nowa encyklopedia powszechna PWN (in Polish). Wikimedia Commons has media related to Grand Duke Konstantin Pavlovich of Russia. Jerzy Lukowski, Hubert Zawadzki (2001). A Concise History of Poland. Cambridge University Press. ISBN 0-521-55917-0. Chisholm, Hugh, ed. (1911). "Constantine Pavlovich". Encyclopædia Britannica. 7 (11th ed.). Cambridge University Press. pp. 1–2.